The AVS Bugflector II® is designed to protect and complement the contours of your vehicle’s hood — keeping it looking showroom new. This custom-molded hood shield is made in the USA and precision-engineered to fit your vehicle perfectly. This hood shield’s high-profile is aerodynamically efficient and provides excellent protection as stones and other debris ricochet away from your hood, fender and windshield. The shield’s durable impact-modified acrylic material makes this accessory wear-and-tear resistant. 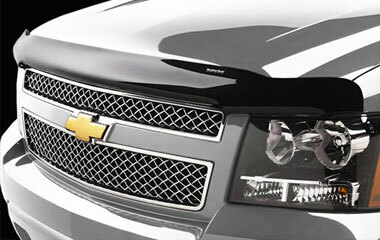 The AVS Aeroskin™ hood shield is perfect for those seeking a non-obtrusive designer look for their truck, SUV or car. The hood shield, designed to flow with the contours of your vehicle’s hood, creates a sleek, stylish profile, flush mounting to your hood. Custom-molded and made in the USA, the AVS Aeroskin is precision-engineered to fit your vehicle’s hood perfectly. The shield’s low profile hugs the surface skin-tight providing excellent protection from the hazards of the road. The shield’s durable yet flexible acrylic material makes this accessory wear-and-tear resistant as well as car-wash-safe. The hood shield is available in a smoke or chrome finish. …The perfect protection and finishing touch!